I cannot cover this wonderous area with just one post, so here are some more images of the area’s amazing geography and vistas. 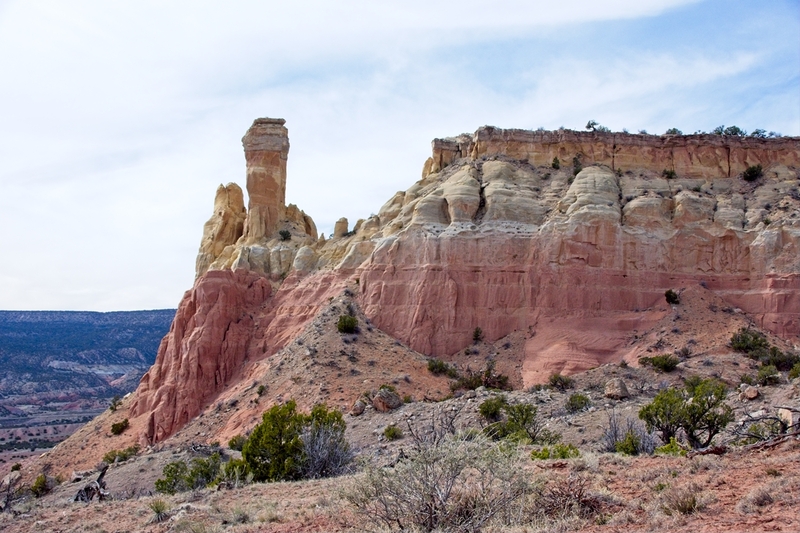 The photos were taken on the drive between Abiquiu, NM, and the famed Ghost Ranch Education and Retreat Center. 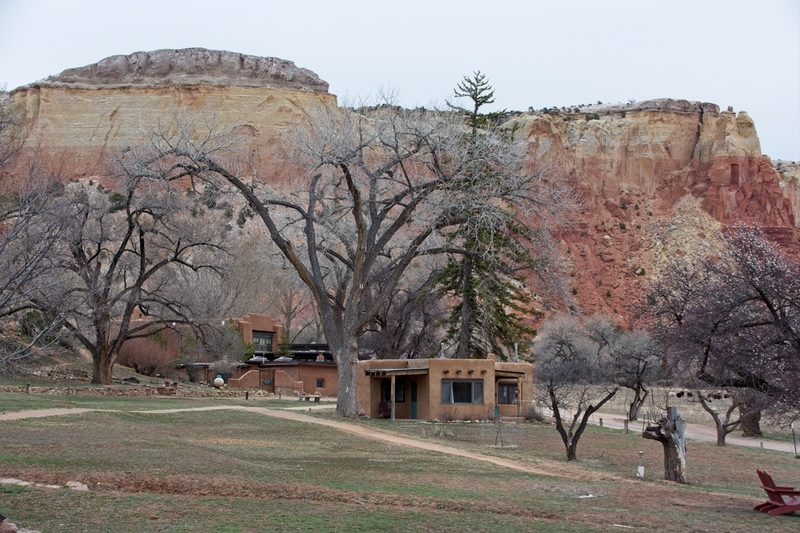 More on my exploration of Ghost Ranch in the next post. 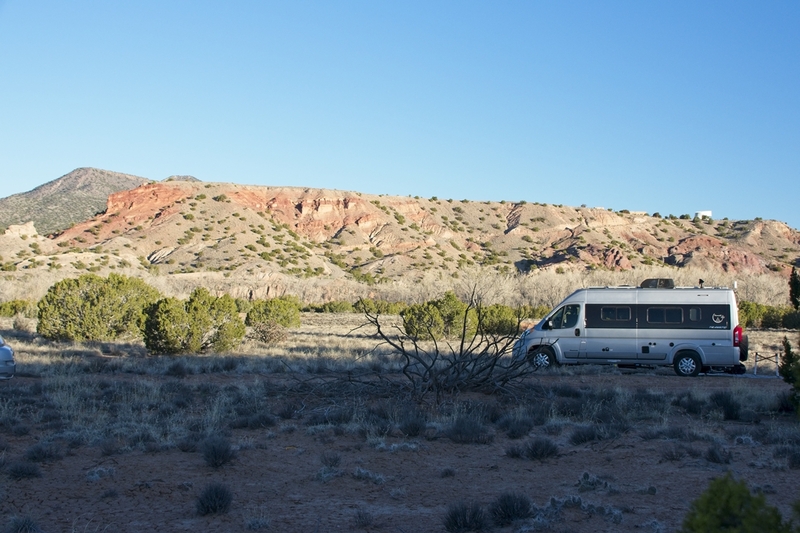 I’m in the middle of a two-week boondocking span in a semi-remote area outside Abiquiu, New Mexico. Staying isolated on a friend’s land nestled between mesas, among the pinions and red dirt with vistas that melt you troubles away. So beautiful, raw, wild, and natural. So much so there’s no cellular signal here (despite my WeBoost tall antenna pole). 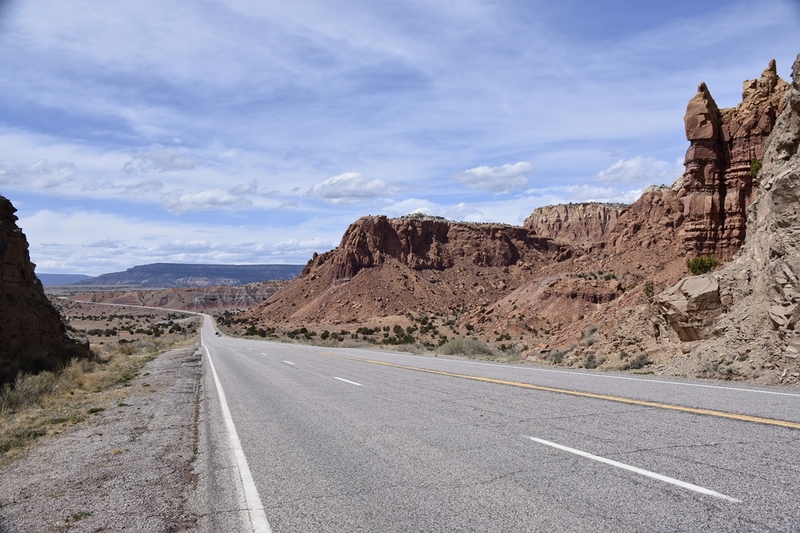 Brief times for connectivity occur when leaving the site to visit the tiny town of Abiquiu (population 231). 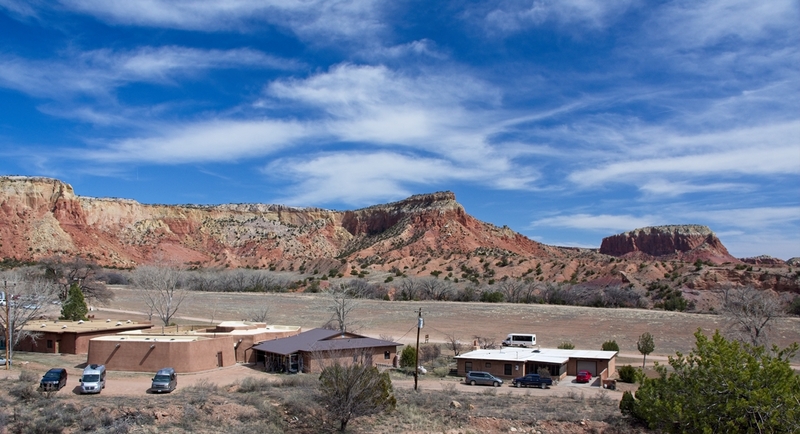 That town name may ring bells for some of you, since it’s the long-time home of artist Georgia O’Keefe, along with the famous Ghost Ranch resort. 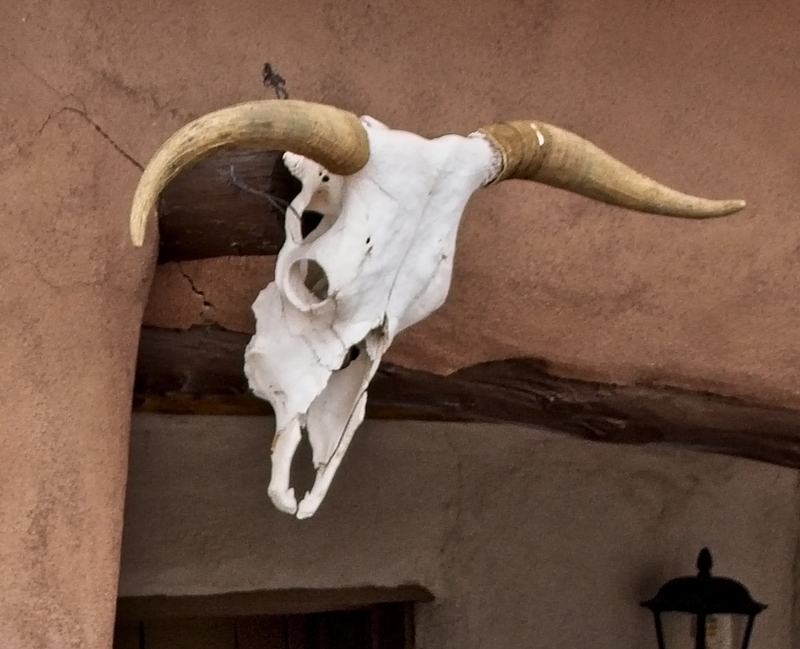 There’s a long history associating her with this town located somewhat between Sante Fe and Taos. 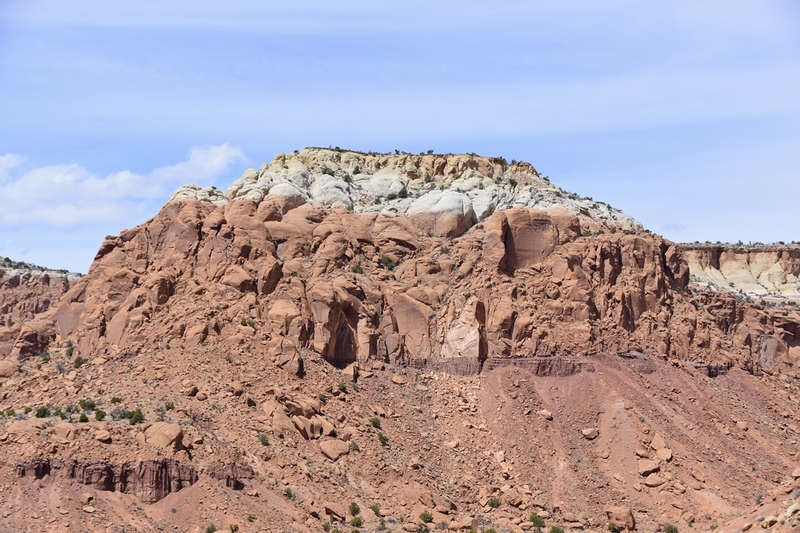 And while that population count may seem trivial, a good portion are resident/part-time artists scattered though the hills and valleys around Abiquiu. Nighttime here is pitch black, save an infrequent set of vehicle headlights moving though the black like a slow, alien ship cruising by. Stars are, as you might expect, sprinkled in the sky overhead like salt on a black velvet tablecloth. 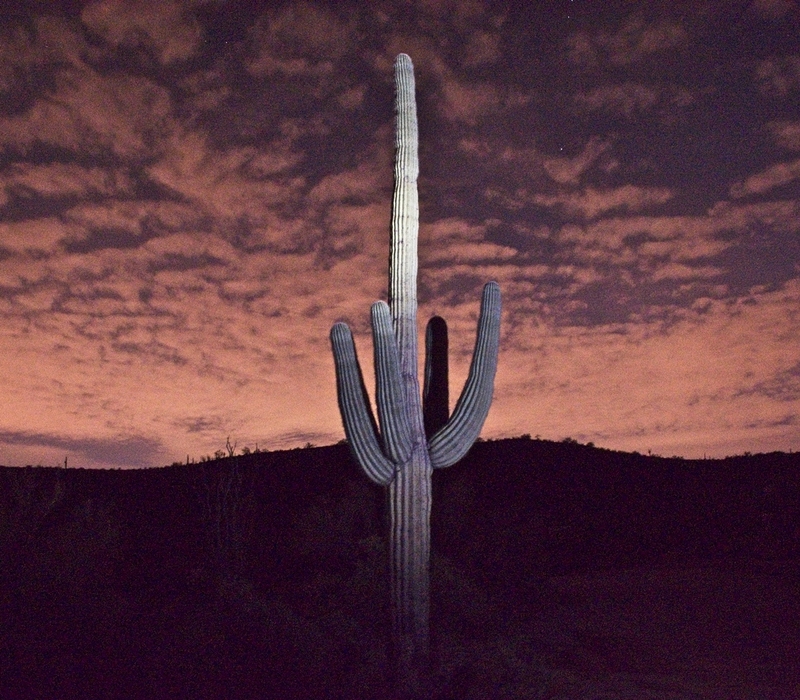 I am going to try some night photography soon, so hopefully the outcome of that cold adventure is worth sharing soon. This state, and especially this place, is mystical. 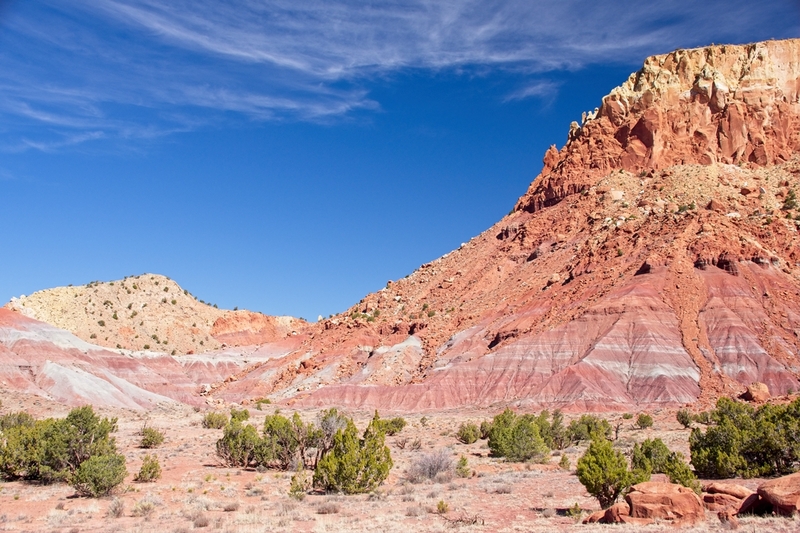 Steeped in Native American history and presence, the stunning geography of the place has a grounding effect with its authentic essence that has to be experienced to be understood. A place like this humbles me and connects me more to nature and its power of patience through time than any other place I have experienced. There’s a draw to my soul here that’s fleeting to understand, but easy to sense something’s happening, burrowing in, and holding firm. Hiking opportunities seem endless and each one more amazing than the last. Photos below attempt to show the stark beauty and amazing forms the geology takes, but they pale by comparison to what one sees hiking here. Days are sunny, and nights are dark and cold — perfect for reflecting on the experience and influence from walking the Earth in such a stunning place. Lots of pictures in gallery below, and more coming soon. 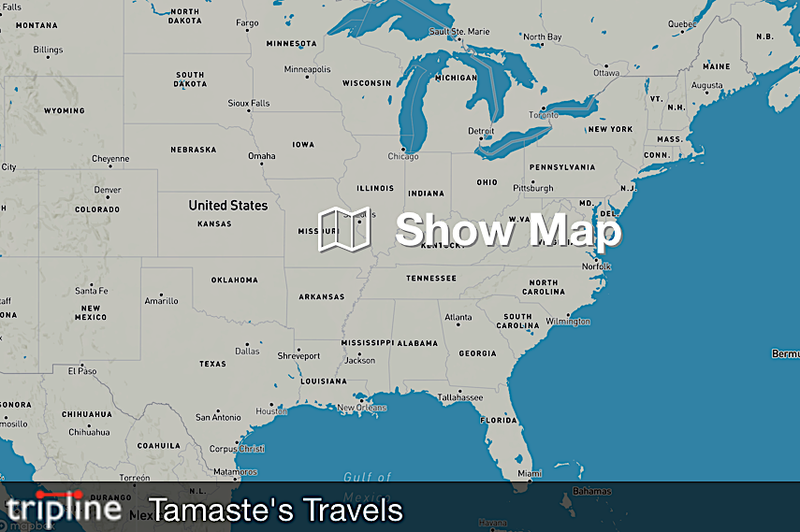 Today marks the first of what I hope are many more travel/nomadic milestones: 100 days since heading out from Findlay, OH and into full-time Tamasté living. I will, of course, share some stats and stuff at the end, but not everyone is into stats and such. So I will first share a before/after intentions snapshot, then a little about what may lie ahead. This post-retirement nomadic wandering thing was going to be all about seeing the country, getting more and deeper exposure to nature, meeting new people…all while able to carve out huge writing-time chunks. I went in committed to full-time van dwelling for a year, then seeing what I felt like going forward. In the process of criss-crossing the USA, I hoped to explore potential places to live or at least create a base if I continued traveling. All the intentions remain in place, but some have morphed and one is not there yet. Overall, it has clearly been a good plan for me and a positive influence. Throughout the 100 days, some shuffling of things in the van happened to make it work better as a daily home, jettisoning some stuff, replacing others not the right thing. I am now strongly leaning to this being an open-ended lifestyle, not just for one year. 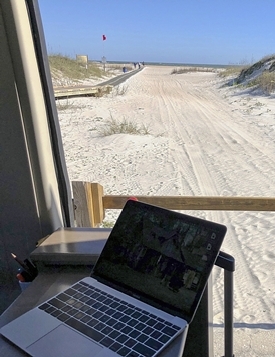 The few things in the way (suitability of the van, ability to find ways to stay places a week or longer, doing without things, social interactions, etc.) are evolving and resolving. I’m currently figuring out whether to stay with the K van layout I have and mod it further to fulfill three perceived voids (dinette-type seating, more storage, better batteries), or sell to get a GL resolving those now-desired voids. Either way, I am past the temporary thought about going bigger and settled on the Travato being ideal for my nimble, nomadic life. The idea of a base place still exists, and so far my possibilities short list based on places visited includes penciled entries for West Texas (Big Bend Region, but specifically Fort Davis) and New Mexico (multiple spots). Emotionally, the travels so far provided a good, mental cleansing and time to settle some things. I was never concerned about loneliness or being lonely, but what brief thoughts arising around those issues are gone from meeting and developing numerous new, Travato tribe friendships. I feel I have (for me) about the right amount of face-to-face social interactions and online conversations to make loneliness a non-thing going forward. I am, finally, out of vacation mode and the pull to see every cool thing I drive by. I still want to explore some of those, but no longer the major pull of this ongoing adventure. The one intention not there yet is my writing work. While writing blog posts and a near-daily travel journal, I have not yet found the expected writing routine of five work days/week to work on two book projects plus articles and other works. On health and fitness issues and goals, I am doing well. Not perfect on all levels, but eating and feeling better than before I started while putting in significant miles/steps on hiking adventures. Will continue to ramp up these self-health bits and make them routine. Lastly, the single biggest logistical obstacle is how to affordably stay in one place for 7-14 days. While I truly enjoy the driving, moving about that much is disruptive and influenced not meeting writing expectations. Much savvier (and confident) now about boondocking or dry/disperesed camping, and on how to find these opportunities, which will open up longer stays in one place. I have applied to be a camp host at the Davis Mountains State Park for a month or two, and if an enjoyable experience, will likely camp host somewhere once or twice each year. Surprisingly, I am more open now than my pre-nomad-self to accepting offers from strangers for driveway nights and boondocking on their private lands. It helps that most of these strangers are in the tribe, where no one is a stranger even if never met before, yet this openness with people still technically strangers is a new shift for me. I mentioned above the pending decision to stay nomadic past the full year, and the rig dilemma/decision coming soon. And also the shift into finding places to stay put longer and thus drive less (which will definitely help my bulging monthly gas costs). I am not ruling out periodic travel pauses to explore other travel options. In late April, I travel to Hawaii for five weeks to visit my boys, and have plans for a similar park-the-van-and-go travel next year as well. And still continue considering places as a travel base to spend a few months each year but otherwise travel to continue exploring and writing in the wild. But…these are forward speculations. This journey is about one day at a time, with open expectations for next. Onward through the fog and down the roads, whether paved or not! It is only going to get better. Stay tuned to find out what really happens! Yesterday under bright, blue Arizona skies I headed down the road on a day trip to the historical towns of Tombstone and Bisbee. Although I’ve never been to either, I’m well aware of Tombstone’s historical events and place in our western culture and yore. Bisbee was a curiosity to me, having no knowledge of it except from an article in American Bungalow’s gorgeous magazine (think Architectural Digest but single topic). Said article touted Bisbee as having a concentration of restored bungalow houses, and having restored my former 1920s bungalow in Findlay, OH, was curious to see that many examples at once. The article also showed the Bisbee Diner, an eatery in a restored railroad dining car. What’s not to love about that 1-2-3 combination for a day exploration trip? Um, plenty, for me, as it turns out. But first, the version to support both chambers of commerce, followed by…the rest of the story. Tombstone’s history is well-known to any western history or movie buff, or even those of us not exactly buffs but do enjoy the genre. My first stop was the legendary Boot Hill, famed backdrop to many a western film’s story and tear-jerk scenes. The graveyard went into neglect and was nearly lost to nature, but years of citizen involvement to research and restore the main part paid off. The history is well documented, and the site a good representation. They’ve done a good job of keeping things orderly and the pamphlet for the tour is quite good, as is the view from Boot Hill. Next, into town I rolled and parked at the famous courthouse, then wandered the downtown, “restored” street meant to closely resemble life in the 1880s in this famed mining outpost. There was the OK Corral (I didn’t pay to get in nor wait for the daily famous gunfight reenactment, and the usual saloons and other stores. A U.S. Mail stagecoach was on hand for tours and rides I suppose as well. The main street was dirt and closed off to vehicles, so one could wander and try to envision what it was like back in those wild west days. 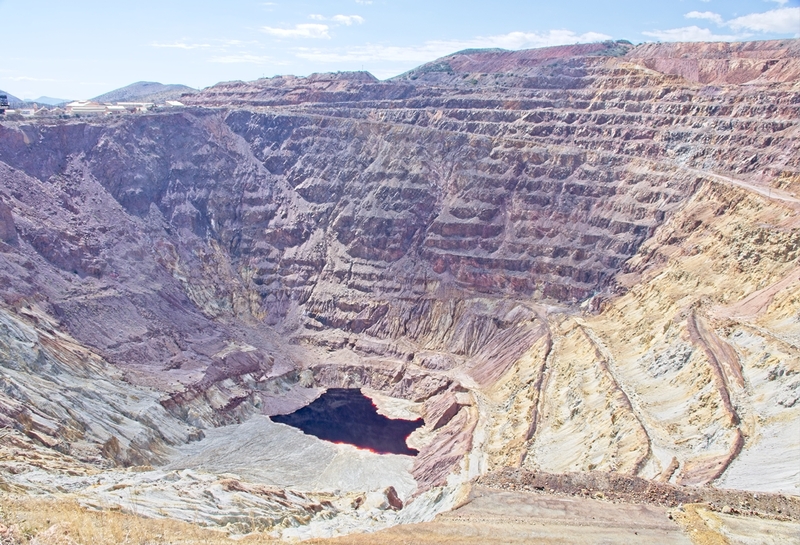 Unknown to me, Bisbee’s was settled in the 1880s to support local mining, and grew as the number and scale of local mines expanded. I expected a flatish, southeast Arizona desert location based on inference from the magazine’s pictures, but to my surprise, it sits in a small, tight valley surrounded by steep, low mountains. Driving in, I could have been going into Aspen or other such towns nestled in mountains with maximized real estate. Although Aspen doesn’t have those screaming red dirt mountains. 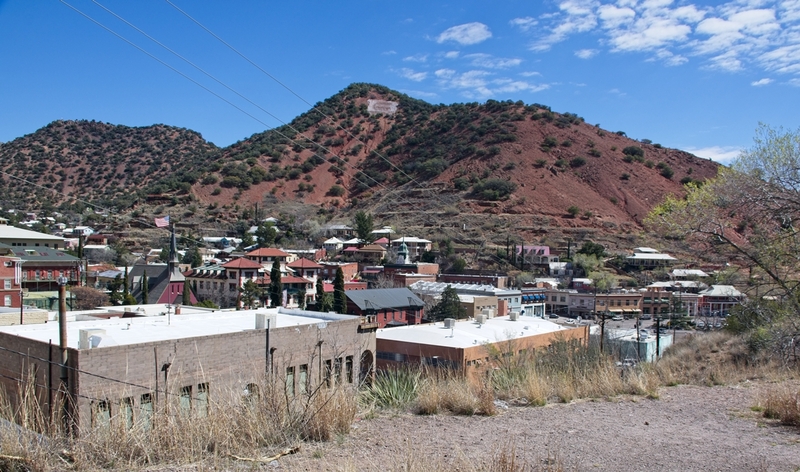 Bisbee would delight those who love endless boutique hotels, quaint restaurants, gift shops, and other such things. Housing in Bisbee is tight and steep, and the drive through the town and up into residential areas was fun, curvy, steep and great people watching and eccentric house looking. Half the population seemed like tourists or supporting such, and the other free spirits of an artistic persuasion. Parking was hard to find, and the tourist lots pricey, so my time there was mostly roaming around in Tamasté and enjoying the variety of people, homes, and surprises tucked in along the way. 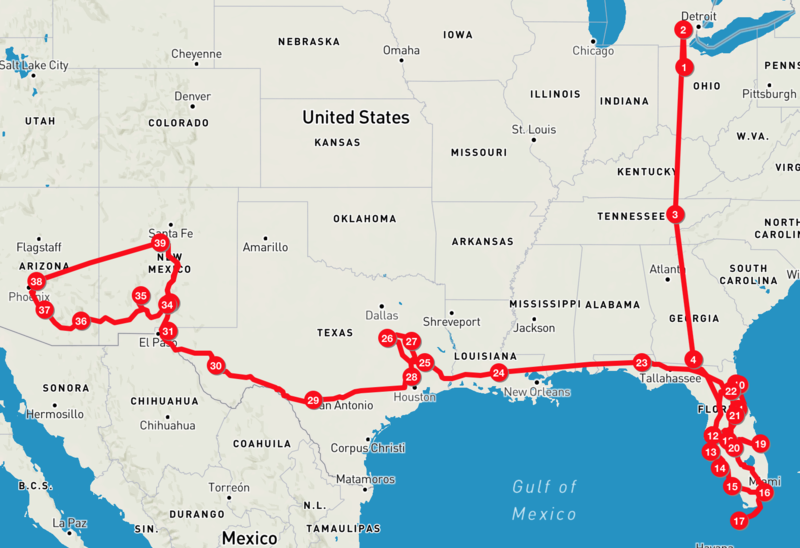 I’ve noticed on these nearly 100 days of solo van travel and living that I truly enjoy those moments where nature takes dominance and I feel a connection and relief in areas devoid of over-population or land abuse. And while I enjoy seeing historical sites (and there are more than one can take in here in the Southwest), I grimace when history meets capitalism: guess who wins out in the presentation and experience. Tombstone was, to me, more carny and amusement park than historical restoration and representation. No question one is aware of the historical pieces, but hard to relate or envision life back then when there are so many shops selling trinkets and boutiques expensive clothing and jewelry, combined with the obvious effort to extract every tourist dollar they can every way you turn. Understand that they can’t show what doesn’t exist, and likely little of the town has buildings and pieces from 140 years ago. Exceptions are obvious: the famous county courthouse is original (at least exterior), as are a few wagons and such, and no doubt the bodies in boot hill are original, but the efforts to maintain the facade of authenticity are understandably reproductions. 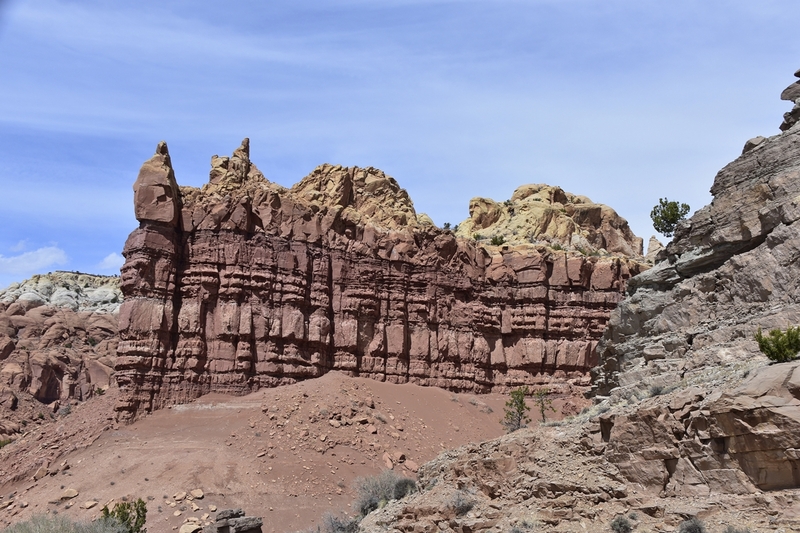 For those who enjoy these sites, and can look beyond the tourist-trap veneers and connect to the history, more power to you. To me, I’d rather explore the history through books and documentaries than try to peel back the ubiquitous layers of commercialism to feel the historical presence. Bisbee caught me off-guard. While I saw some bungalows, I never found the extensive streets mentioned in the article. Nor did I find that picturesque dining car restaurant. And if I’m not a fan of the commercialized historical venture, you can probably guess I’m not one to park and walk and shop all day long in such places where consumerism is running amok and a town’s existence relies on tourism. Once a supporting town for the huge mines around it, they had to turn to something to survive, so understandable, but not my cup of tea. Speaking of mines: the shock of driving past this quaint, picturesque ex-mining town nestled in the mountain valley, then immediately rounding the curve to witness the gaping maw of destruction from the Copper Queen Mine (shut down in 1975, but kept open and non-functional expressly for tourist mine tours) is jarring to the soul. I’ve seen mines like this before, but never in juxtaposition from a town like this. The effect was unnerving and shocking. 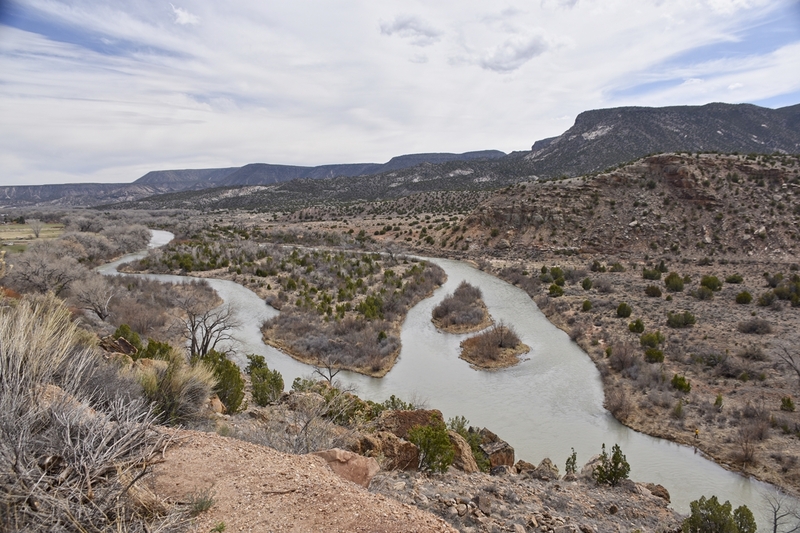 And unlike the mines around Silver City, NM, where they are still active and reclamation projects continue to recover the land somewhat, this raped landscape is simply a massive, Earth wound that may never heal. It is at once fascinating and repelling, which is as odd a combination as was seeing the quaint town then filling one’s eyes with the reality of this huge, man-made pit. As I continue traveling, I feel more and more the strong pull toward untouched nature and fewer “gotta see” places where I know man and greed exploited. I’m not on this journey to be entertained; it’s not a vacation trip. My need is to re-connect with nature, and my consciousness expanded at every chance, along this path of self-discovery and expression. My love of National and State Parks stems from their stewardship to allow us to see the natural wonders without the over-gloss of carnival and commercial trappings. Yes, they all have gift shops, but you’re not forced to exit through them in hopes of adding to their profits (thank you Boot Hill Graveyard). And yes, such things are part of how these places stay in business. But as I wander, my soul’s joy clearly and consistently comes from places where as little trace of man and man’s abuse of nature exists. There I can more freely envision life back then, and feel strongly connected to nature in ways difficult to translate into words. 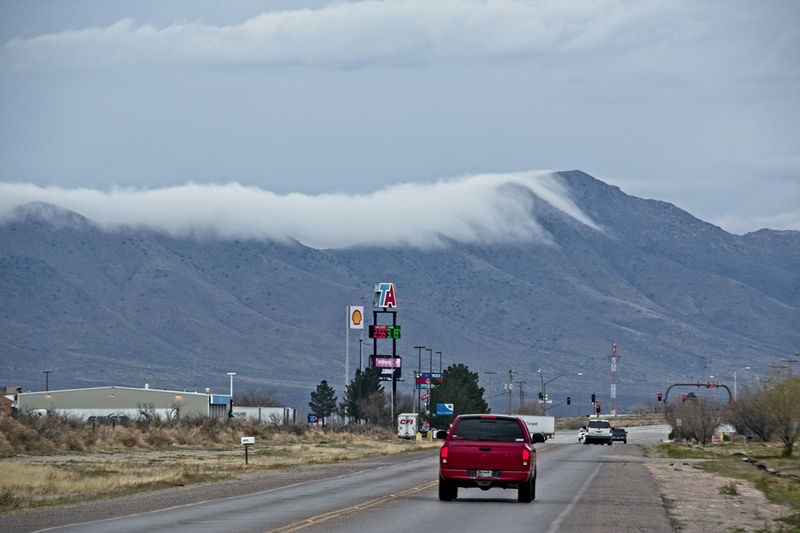 It’s been rough most of the last few weeks dealing with the high winds and frequent dust storms in New Mexico. As a rest and regather stop, I’m at a Boondockers Welcome hosts’ home in Southeast Arizona for five nights, specifically seven miles outside the tiny metropolis of Willcox, Arizona. 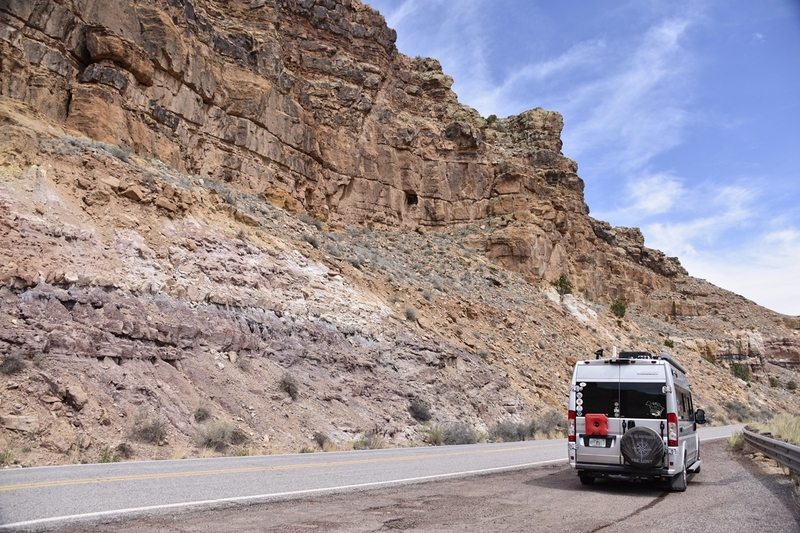 An inexpensive annual club, Boondockers Welcome consists of RV-friendly hosts who list their places to boondock at for one to five nights for free (or if provided, a tiny payment for hookups). Hosts are typically RVers themselves, so it’s a way to meet more people in the tribe, so to speak, for both guest and host. Since arriving, I’ve wallowed and done very little! Not pure nothing, but close. Needed the break to just be, and outside of a few excursions into Willcox proper (and more below on making the most of the least), just rested, read, slept a lot, prepared food for ahead, etc. 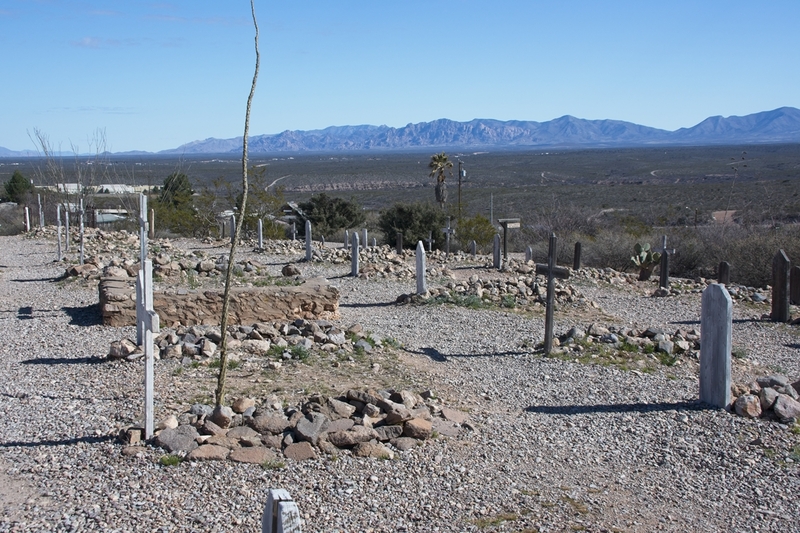 Tomorrow is a bit more exciting as I head over to explore historical Tombstone, AZ, then on to eccentric Bisbee, AZ, in the afternoon. Meanwhile, in my lazy, no-hurry state, I experienced the pleasure of exploring a small town that on the surface seems like a place you’d drive by and ignore, or perhaps stop and gas up there, but drive on with nary a second thought about the people living there or their town. 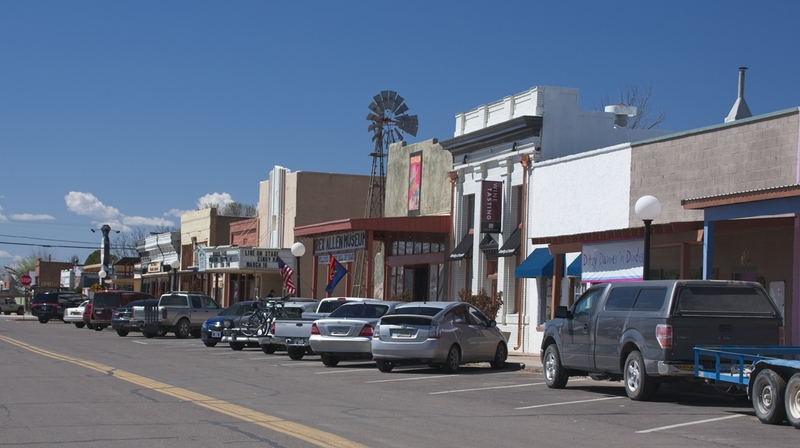 Willcox’s population of around 3,800 seems too small to support much of anything, but is essentially an agriculture and ranching community, with a good sprinkling of retirees living in the open plains nestling up to those mountains I never tire looking at. 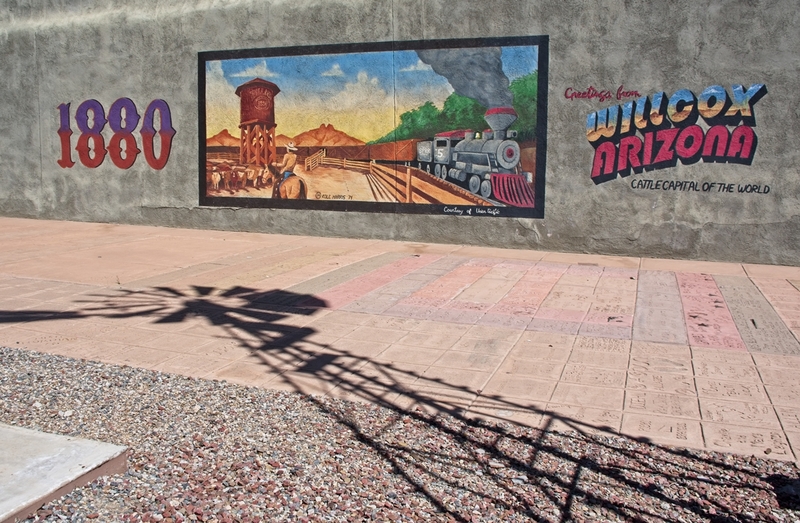 Interestingly, the Willcox wine region area produces 74% of wine grapes grown in Arizona. As with small towns like this, what you first see is usually not the best part of the town. The outskirts where the ACE Hardware, Hitchin’ Post Cafe, and Safeway lie could be anywhere USA. Other parts are somewhat abandoned, or run down, but still in use. The real gems of these little towns are found in their original downtown area where, if they had a robust history, you’ll likely find something special. 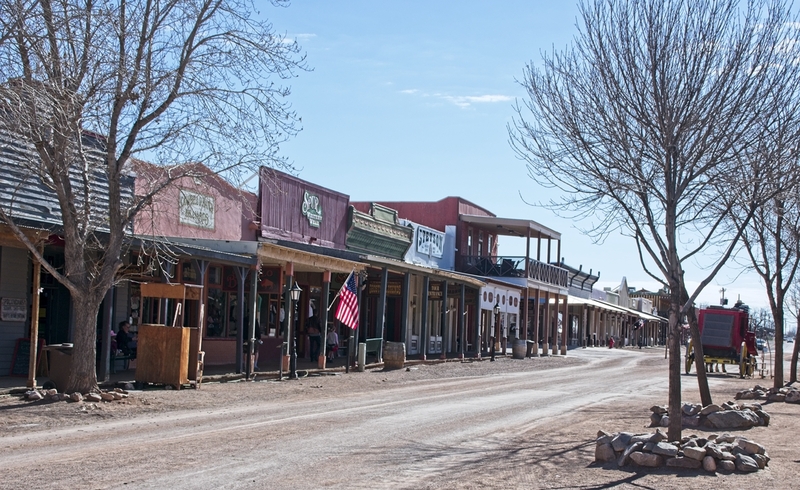 Way back in the day (really way back) the railroad fed Willcox and by the number of old buildings kept intact in the historical downtown district, it must have been quite the place. Now these old buildings are boutiques, or themed restaurants, thrift shops, junk shops, even the old movie theatre is still there screening modern movies. Even though the downtown places are somewhat (okay, mostly) touristy, they’re still interesting to roam around on a sunny, cool day in Willcox, Arizona, with those mountains as a perpetual vista before heading on to other adventures in a few days.